Home » international news » Turkey’s snap election yields surprises on all sides – what next? It was another surreal night in Turkish politics. That the elections were suddenly brought forward by more than a year was a surprise in itself – but the standout surprise of the campaign was the sudden rise of opposition candidate Muharrem Ince. To everybody’s amazement, during a campaign lasting only 50 days, Ince transformed himself from an also-ran into a serious contender. He managed to pull support from all sections of society to his large rallies with an election slogan of “we will make peace, we will grow and we will share”. While his supporters never thought a second round presidential vote would be anything but a foregone conclusion, they hoped Ince could capture enough of the vote to force one to happen – or even win the first round. But they were sorely disappointed. 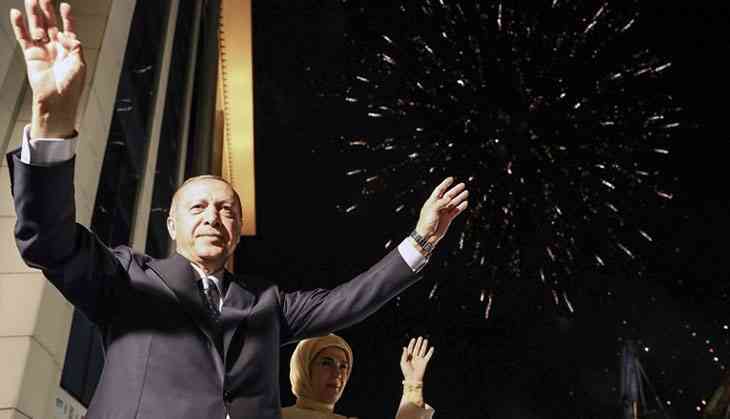 Instead, the sitting president, Recep Tayyip Erdoğan, pulled off a surprise of his own: he captured nearly 53% of the presidential vote, heading off a second round, while Ince garnered only 31%. While he accepted his defeat, he looks set to remain a significant opponent to Erdoğan, especially if he becomes the leader of his party, the CHP. There were many other surprises besides. The HDP, the main pro-Kurdish party, managed to enter parliament even though its leader spent the campaign in prison. The nationalist MHP, the AKP’s election ally, managed to get more than 11% even though its leader didn’t organise a single rally. This will deprive the AKP of its outright parliamentary majority, meaning it will be more dependent than ever on the MHP. At the same time, these results usher in a dramatic realignment of the political system. Turkey’s president will now hold extensive executive powers, and parliament will be much less significant. There will be no prime ministry, and all ministers will be appointed from outside the parliament by the president. For those who have been worrying about Erdoğan’s increasingly autocratic rule until now, it seems their nightmare is about to enter a new phase. But Erdoğan isn’t out of the woods either. The country is facing one of its most serious economic crises of recent times, with the Turkish Lira worryingly weak and interest rates climbing. Turkey is hosting at least 3.5m Syrian refugees with no prospect of a peace settlement in the hellish conflict across the border. Erdoğan has only a few friends in the international arena besides Russia’s Vladimir Putin. The prospect of EU membership has evaporated, and the US is now far from a dependable ally. The Kurdish crisis, too, is still waiting for a political settlement, but the AKP’s increased dependency on the staunchly nationalist MHP will make a political resolution on that front even harder. More importantly, these elections leave Turkish society all the more polarised and divided. For the 50% that voted for parties other than the AKP in the parliamentary polls, Turkey is a country of fear, mistrust and uncertainty. Erdoğan will need to work hard to win their hearts and minds, though in recent years he has seemed mainly interested in catering to his own 50% of the population. With the promises made by opposition candidates during the election campaign, Erdoğan has also promised a prosperous new Turkey, a high-quality democracy where the rule of law would be the norm. He promised to lift the state of emergency shortly after the elections, to build his controversial Istanbul Canal, to open public parks throughout the country, and give every neighbourhood its own state-run cafe where tea and cake would be free. Given the state of the economy, these promises sound like a tall order. But having run the country for 16 years, one thing Erdoğan has on his side is experience. Indeed, that’s why many of his supporters voted for him. But promises are all very well; the question now is whether Erdoğan will make good on them – and what will happen if he doesn’t.